This experiment was invented by Loralee Leavitt. Please do not copy, sell, post, publish, or distribute all or any part of this material without my permission. Instead, feel free to link to this website, and to contact me with questions. M&Ms and Skittles sink in water--mostly. To see what floats, try this. Drop the M&Ms or Skittles in the water, letter side up. The white letters on M&Ms and Skittles are printed with edible ink that doesn't dissolve in water. When the rest of the candy shell dissolves, the letters peel off and float. Some of the letters break into pieces, but a few should survive intact. Find a Floating Letters worksheet by Science Gal here! You're right, it is definitely cool. When I do it, usually only a few letters make it up to the top. Try it with warm water, that might help. And don't stir, whatever you do, because that breaks the letters up. It also takes a few minutes to do. 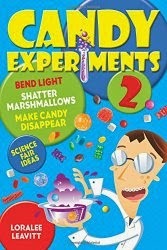 You might want to put the candy in water, do another experiment, and come back to look at it. Yes, the letters float and the rest of the candy sinks. The rainbow of colors at the bottom is really cool, isn't it? If you don't stir, the colors stay separate for a long time. I'm going to have to try this with my son. He would love it! I'd like to use this for an enrichment program I teach at a local preschool. Along with the materials I give my kids I was planning on linking to your site and your book. Please let me know how you feel about that. Thanks! Go ahead and use this for your preschool. Please refer to the website and the book with anything you teach, or on anything you hand out (as it appears you already plan on doing). Thank you so much for asking, and let me know how it goes! I'd rather have you link to the site, but please share the website with your friend. We have some really fun science activities. I did this in sprite as part for my science fair project it was really cool. This is a very cool experiment. How did you get the idea? When my daughter was little, she wanted to put candy in water to see what happened, so we did it with lots of kinds of candy. We were really surprised to see this one! That's when we learned that most candies are covered with a waxy glaze or shellac to keep them from absorbing water or dissolving or getting sticky. If there's a letter printed on the shellac, it can float. So much to learn about candy! Dones it work with smarties? This works with candy that's coated with a glaze, and that has a logo printed on the glaze, like M&M's, Skittles, and Jelly Bellies. It doesn't work with conversation hearts, because that logo is stamped right into the candy. If the Smarties have a logo printed on them in glaze, it might work, but I don't think I've seen any like that. Can I use this activity for my school's Math and Science night? Absolutely! Let me know how it goes. May I use this for my science fair project? The candy is covered with a glaze, like wax or shellac. The coating peels off and floats. If a letter is printed on the coating, it can float too.